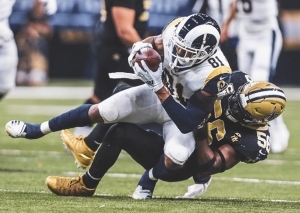 Former Columbia High football player Gerald Everett persevered against the obstacles put in his path on the way to be playing tight end for the Los Angeles Rams in Super Bowl LIII this coming Sunday in his home town Atlanta’s Mercedes Benz Stadium. Everett transferred several miles across DeKalb County to Columbia High School from Martin Luther King Jr. High heading into his senior year in the summer of 2011. He had dreams of playing basketball for legendary Columbia coach Phillip McCrary (598 wins, 5 state championships). It was going to be hard for him to break onto the squad that had won two consecutive state championships and going for what would be a third. Coaches talked the 6-4, 200 pounder into playing football for the first time since his freshman year. He would go on to catch 13 passes for 224 yards (17.2 yards/catch) and three touchdowns as senior in a run oriented offense. He did not get the attention from Division 1 schools as several teammates and many other DeKalb County athletes got and after signing with Bethune Cookman decided to put in some work at Hutchinson Community College in Kansas to improve his skills. After finishing at Hutchinson, Everett went to the University of Alabama-Birmingham in 2014 and played in seven games with 17 receptions for 292 yards (17.2 yards/catch) and one touchdown. UAB shut down its program following that season and Everett was tested again as he looked for another place to land. He found a spot at the University of South Alabama and made the most of it where in two seasons he caught 90 passes for a total of 1,292 yards (14.4 yards/catch) and 16 touchdowns. His performance in the Senior Bowl got him noticed and in 2017 he was the Los Angeles second round pick (44th overall). He went from 16 receptions for 244 yards and 2 touchdowns as rookie in 2017 to 33 receptions and 320 yards and 3 touchdowns as the Rams finished 13-3 as the NFC West and NFC champions and a trip to the Super Bowl. 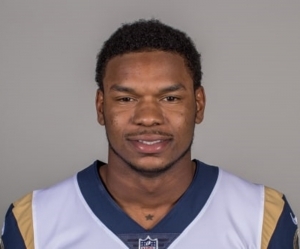 Everett’s big game was in a 54-51 Rams win over Kansas City when he had 3 receptions for 49 yards and two touchdowns. He had two receptions for 50 yards in the Rams 26-23 come-from-behind NFC Championship win over the Saints in New Orleans to earn the trip to Atlanta. DeKalb County is no stranger to having players in the Super Bowl as Everett becomes the 12th player from the DeKalb County School District to reach the world stage in the NFL’s championship game. Eight of the previous 11 have come home with Super Bowl rings including Harris Barton (Dunwoody, San Francisco 49ers), Steve Wallace (Chamblee, San Francisco 49ers) and Patrick Pass (Tucker, New England Patriots) who all have three Super Bowl Championships rings. Tucker’s John McMakin was the first DeKalb County player on record to reach a Super Bowl playing in Super Bowl IX with the champion Pittsburgh Steelers. The last DeKalb County players to play on the winning Super Bowl team were Jeff Saturday (OC) and Robert Mathis (DE) for the Indianapolis Colts in 2006. Will Everett join his fellow DeKalb County tight end McMakin with a Super Bowl title on Sunday? Georgia High School Football Daily’s Todd Holcomb contributed to this story.